Swimming Pool Liner - New Vinyl Liners. Let us meet with you and show you the newest most popular liner designs! Call now for more information. If you are thinking about a vinyl liner, there are the things to consider before choosing you new liner pattern. In selecting a swimming pool liner, the darker pool liner patterns will make your pool appear in a darker and richer blue color. You can click on the GLI POOL PRODUCTS logo below to see how a pool liner will look in an actual swimming pool and how the liner will appear with a particular liner pattern. At McMillion Pool Co. we take great pride providing an installation of a tip top notch pool liner. Pool measurements are taken by a professional. The New Pool Liner is will ship from in 1 to 3 weeks. 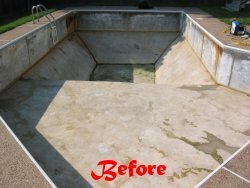 Your Old Pool Liner will be removed. Any surface repairs (under liner area) will be completed. Your New Pool Liner is installed. 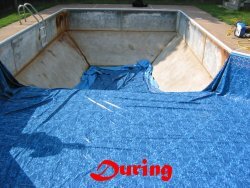 The Time frame for the pool liner installation is 3 to 10 days. 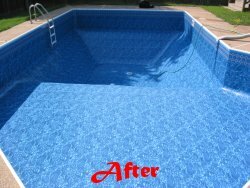 Please Call and schedule your free vinyl pool liner estimate today. Our 20 and 28 mil thick vinyl pool liners are engineered to withstand the harshest weather conditions and strong ultra-violet sun rays in the South. We know our pool liners are the best, that’s why we back them with a 20 year pro-rated warranty. Touch and feel the difference in the first fully textured and embossed designer vinyl liner ever! Infused with iridescent inks, it glitters and sparkles. Exclusively from LOOP-LOC, this PearlEssence™ pattern is simply brilliant! White Base/Available in 20 & 28 mil. Enjoy the essence of PearlEssence™, featuring shimmering blues in all their cool and captivating glory. Opalescent Blues is available in 26 mil. textured pattern for pool steps. Deep, delightful, dappled and designed to free your spirit and illuminate your senses with a tranquil, sparkling glow. Experience the luminescence of PearlEssence™. Luminous Soul is available in 26 mil. textured pattern for pool steps. Cream Base/Available in 20 & 28 mil. Bronze iridescent inks create a bold and beautiful style to give your pool a serene yet rich glow that is characteristic of the PearlEssence™ collection. Bronze Reflections is available in 26 mil. textured pattern for pool steps. Silver iridescent inks glitter like the proverbial silver lining of a cloud, or the glow of pearls - a most appropriate allusion to the PearlEssence™ name. Silver Cloud is available in 26 mil. textured pattern for pool steps. Dress your oasis in dark and mysterious tones with a shimmery, sophisticated look from PearlEssence™ that elevates pool aesthetics to those of fine culture. Platinum Onyx is available in 26 mil. textured pattern for pool steps. Like floating in another world, this delightful and elegant PearlEssence™ experience that captures the glittering golden brilliance of the sun and radiates it upward. White Golden Sand Bottom is available in 26 mil. textured pattern for pool steps. In the most remote regions of the Pacific lies Oceania: home of Samoa, Hawaii and French Polynesia. Why not turn your pool into paradise? Island Jewel Bottom is available in 26 mil. textured pattern for pool steps. Brilliant Blue Base/Available in 20 & 28 mil. They say that on Antigua, life is a beach. Bring that fabulous free and easy feel to your own private refuge. Cobalt Kontiki Bottom is available in 26 mil. textured pattern for pool steps. There's no better way to chase away the blues than by relaxing in a deep blue oasis. Take the plunge! Tan Base/Available in 20 & 28 mil. Ibiza is the Mediterranean island where the world goes to play. Spend sun-splashed days soaking up its vibrant, Spanish-influenced atmosphere. Sandy Cove Bottom is available in 26 mil. textured pattern for pool steps. Make waves with this unique and aesthetically pleasing design. Evocative of the British Virgin Isles, where yachtsmen and pirates alike have called home. Light Blue Base/Available in 20 & 28 mil. Reminiscent of the elegant spas of Europe, this understated, classic pattern creates a mood and sense of style you'll never tire of. Sea Blue Bottom is available in 26 mil. textured pattern for pool steps. This gently interlaced pattern exemplifies why you installed a pool in the first place: to experience a spirit of peace and harmony. Enjoy. Laguna Riviera Bottom is available in 26 mil. textured pattern for pool steps. Reminiscient of the pristine pebble-strewn sand beaches of alluring Captiva Island. You'll want to kick off your sandals and dive right in! Whitewashed Pebble Bottom is available in 26 mil. textured pattern for pool steps. Acqua Blu, the second gorgeous pattern in our Botique Collection, is like an elegant carpet of multi-toned mosaic tile. As if a group of fine, Italian craftsman labored for weeks to create it. Acqua Blu is available in 26 mil. textured pattern for pool steps. Standard Blue Base/Available in 20 & 28 mil. Bella Vista is the premier entry in our new Boutique Collection, featuring a gorgeous yet subtle repeating mosaic pattern. Bella Vista is available in 26 mil. textured pattern for pool steps. The shoeless, carefree, laid-back lifestyle of one of America's most venerated getaway spots is evoked in this lovely design. Bayview Bottom is available in 26 mil. textured pattern for pool steps. Artsy, cool and oh so Deco: that's the style and sophistication that this exclusive pattern brings to any backyard retreat. This fresh, fun design combines a playful border of dancing water waves with a glittering yet serene marine sparkle bottom. Marine Sparkle Bottom is available in 26 mil. textured pattern for pool steps. Gentle, intertwined waves of cool, blue tile patterns, designed to make your spirit float and your cares drift away...Serenity at last! This LOOP-LOC exclusive design creation is an extraordinary blend of geometric purity and pure inspiration. It's the moment you wait for all day … as the setting sun illuminates your perfect afternoon and exquisite color explodes on the horizon. Dark Blue Base/Available in 20 & 28 mil. True to the island "jewel" of the Aegean Sea for which it's named, this new creation brings a beautifully deep blue to your backyard retreat. Blue Beach Pebble Bottom is available in 26 mil. textured pattern for pool steps. This new LOOP-LOC exclusive combines exotic Bahamian elements with elegant style for a sparkling addition to any pool design. Electric Teal Base/Available in 20 & 28 mil. Immerse yourself in the signature color of peaceful and serene seas. Give a teal Caribbean feel to any pool. Squares are 2"x2". Caribbean Teal is available in 26 mil. textured pattern for pool steps. Bring a bold statement of style to any pool by evoking the charm and sophistication of Santa Fe, and pay homage to the sun gods of the Southwest! Mosaic Ocean Bottom is available in 26 mil. textured pattern for pool steps. Electric Blue Base/Available in 20 & 28 mil. The Blue Grotto on the magical isle of Capri creates breathtaking hues of blue light as the sun bursts through its waters. Now you can bring the magic home. Blue Grotto Bottom is available in 26 mil. textured pattern for pool steps. Turn your backyard into an exotic and tranquil locale, reminiscent of the romantic Caribbean. Enjoy sun-drenched days in the cool blue of Belize. This style is simple and serene … just like the Long Island destination for which it's named. Classically elegant, this popular design brings out your pool water's natural beauty. Please note: this pattern has a solid blue selvage edge on the top which will show under the bead and before the pattern starts. The wondrous colors of the ocean depths are captured in all their shimmering beauty in this liner design, introduced just this year. An island paradise of pristine beaches, refreshing ocean breezes and cascading waters are brought to life in your backyard. Available in 20 & 28 mil. Available in 28 mil. only. Available in 20 mil. only. Available in 30 mil. only. Swimming Pool Liners by Loop-Loc Mnf. Loop-Loc builds the highest quality swimming pool liner in a choice of 21 pattern combinations to fit all sizes and shapes of pools. Our liners are engineered to withstand the harshest weather conditions, from the harsh weather cycles of freezing and thawing in the north to the strong ultra-violet rays in the South. 1. Customer selects a pool liner pattern. 2. Pool measurements of old pool liner. 3. New Pool Liner is ordered. 4. New Liner delivery time of 1 to 3 weeks. 5. Old Liner is removed. 6. Surface preperation are completed. 5. New Swimming Pool Liner is installed. 6. New and new skimmer face plates. 6. Pool liner is installed in 2 to 4 days. Please contact us via phone or email for a free initial telephone consultation.